Some hot water dissolves the solids, and then everything is combined along with more water. The pork belly goes in, and the mixture brines overnight. The sachet goes into a vacuum-sealed bag with chicken stock and the pork belly. ... and then vacuum-sealing that bag before starting cooking. I tasted the seared pieces above (which I only sliced and seared for you, dear reader, to demonstrate that the pork wasn't gross) and... damn. I actually chuckled while I was enjoying my first bite, thinking to myself "Heh... That is really good... Really, REALLY good." The brine was so nice, and I sort of wish I was eating this again right now... This was a fantastic way to do pork belly, and one that will lend itself well to other applications (including pork buns)... The next ingredient you’ll be referred out on is the Quick Pork Sauce. I find the name absolutely hilarious, because even at a glance you can tell that this will in no way be what a normal person considers “quick.” In fact, by the time the last reduction was complete, I had spent 4 hours and 15 minutes making this damn sauce. I shudder to think what it is considered "quick" relative to… Aside from the misnomer, this is actually one of those beautiful parts of the book: the recipe for the Quick Pork Sauce is incredibly well written, featuring both instructions for each step as well as an explanation of why you’re doing things in this specific way. It’s fantastic, and the sauce is actually pretty fun to make... if you're a dork... which I am. Seriously. Pick up this book and read the Quick Pork Sauce recipe someday. You'll be glad you did. You start off with pork bones (I used neck bones). When it is sufficiently reduced, the bones and vegetables are strained out. The mixture is strained and cooled over an ice bath after which the kernels are added and the whole mess (along with a tarragon sachet) can be vacuum-sealed (stupid lack of a chamber vacuum… grumble grumble…), ready to cook in the SousVide Maestro. The soup is now good to go and can be set aside, ready to be reheated when dinner rolls around. Back to our components. Remember the pork belly and “quick” pork sauce? Those are ready to be turned into pasta filling. 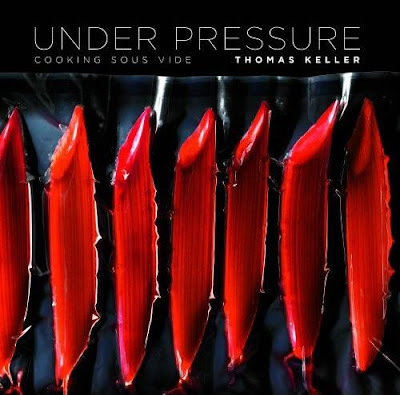 This is a rare moment for Thomas Keller, in which he actually explains that the idea for the filling came from trying to find a good use for oddly-shaped pork belly trimmings that (you guessed it) he had set aside for another use when making assorted dishes. Awesome. 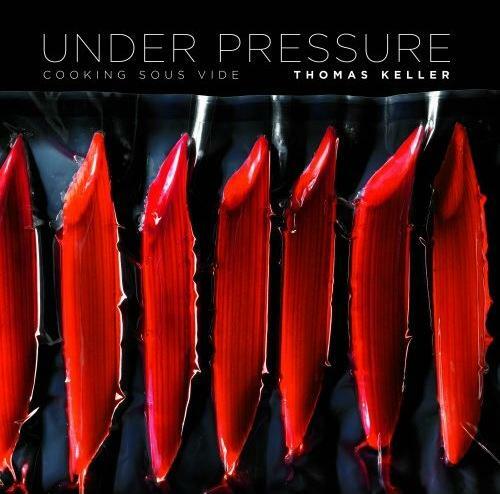 I punted on one detail here, in that I diced the pork belly larger than the 1/8-inch that Keller asks for. The thing is, if you’re going to ask me to carefully make fine dice of a large quantity of something slippery and fatty, you should probably ask me to do that before I spend over 4 hours making a damn sauce… Fatigue was starting to set in by this point, so my dumplings were a bit chunkier than Keller intended (which I actually really liked). After the too-big pork spends a little time in the skillet and is sitting in a strainer allowing fat to drain off (as above), an onion sweats in a little oil and then you make gastrique in the pan with equal parts red wine vinegar and sugar. Alrighty. No time to rest. Next up is the pasta dough. I was originally planning to make the dough recipe as written, but I had to make fresh pasta for my other Thomas Keller dish as well… Since I was on pace for a 10pm dinner (at best) at this point, I made the executive decision that French Laundry Cookbook pasta dough would have to be good enough for an Under Pressure recipe. The ingredients are the same, but I’m not sure if the proportions are identical since one is in weights and the other in quantity/volume. I'll pull a Thomas Keller here and refer you to my French Laundry recipe post for more on the dough... After it's rolled out, 10(-ish) gram mounds of the cooled filling are spaced out along the pasta sheet. The dough is folded over and sealed, then cut into half-moons. At this point I should fold again into a tortellini shape, but I over-stuffed with my too-chunky filling, so I left them as half-moons and was quite pleased with the result. (I'll show the full-moon shape option below, as well...) These are ready to be used, or can be tossed in the freezer for instant yumminess at a later date. The final components are for the "Summer Succotash," and consist of charred red and yellow peppers and blanched hericot verts. The beans are supposed to have the ends sliced off on a bias, then be sliced in half on a severe bias. I may make smaller pieces in the future, because I enjoyed the flavor but wanted to spread it out across more bites. The bell peppers are cut into 1/8-inch dice and set aside with the blanched beans until service.